What is Google Adwords Pay-per-click? Google AdWords is a powerful marketing system which helps you promote your products and services through the Google search engine, and through affiliate sites. When people search for specific phrases that are related to what you offer, your text advertisement will appear as a sponsored link. 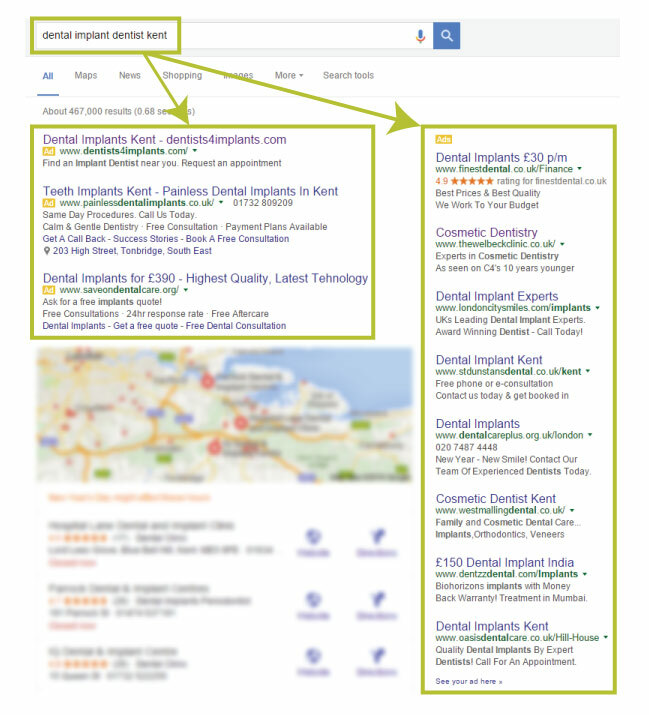 Your ad will appear below, above, or beside the results displayed by Google for related search queries. Pay-per-Click means that you will spend on your advertising only when it starts to work – such as when someone clicks your ad to go to your website, or when someone calls you for an enquiry. Your adverts tell people what you offer, and your unique selling points. After creating the ad, we research and create the relevant search terms (keywords) that will help your ad become visible on Google search results. The final step is deciding on a daily budget for your campaign; after that, your ad is now ready to go live. Your ad will be seen on Google search results if people type in words that match your keywords. Your ad will easily be seen next to, or above the search results. Interested customers will click on your ad to go to your website, or call you directly for enquiries. You will only pay when these customer interactions are made, and not a moment sooner. You will be the one to assign an advertising click budget. You can start with an amount that you’re comfortable with, and then adjust the budget accordingly moving forward. There is no fixed amount that you need to spend as an investment. A daily budget of at least £10 to £20 will be enough to jump-start your advertising campaign. At Very Creative, we do not charge you a % of the results from your advert clicks. We simply charge a fixed fee per month, depending on the size and breadth of your advertising campaign. We will happily provide you with our fee guide. Please contact us soon for more details. It’s very simple, we simply require one month’s notice of cessation. Full terms and conditions will be provided.